We welcome you to our genuine, active and casual healing atmosphere. With upbeat music and a family-friendly practice, True North Chiropractic welcomes children, families, military and law enforcement members. We are passionate about helping children on the autism and ADD spectrum, those living with PTSD and those with service dogs. You’ll meet Dr. Scott for a consultation to discuss your health goals. Our goal on this visit is to understand your concerns, your health history and do an in-depth nervous examination assessment. We’ll also do an Insight Millennium COREScore system to provide a health score that you can use to track your progress. We’ll make sure you’re in the right place for the care you need and create a game plan for your recovery. For your convenience, we’ve made our New Patient Intake Questionnaires available to you online so that you may complete it at your convenience. You can download the paperwork from the side column. We’ll discuss if we can help you, reviewing the results of our assessment to provide answers to what is going on with your health neurologically. We’ll also review what we can do to help you achieve the goals you mentioned in your first visit. And, we’ll talk about how many visits we think will benefit you, reviewing costs and insurance, and will do our best to answer any questions you may have. People love the way our care-windows are set up. Our open-adjusting area and schedule allow you to come during a window of time that works for you. People enjoy getting to see other patients, relating, learning and supporting one another. 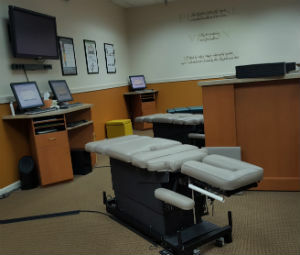 You’ll get adjusted, we’ll talk to you about your progress and make sure you’re on track for your goals. “We’ll have fun, too!” We’ll discuss the things going on in your life and have light-hearted chats to make wellness exciting and interesting. It’s important to us to connect you with other people and resources that will enhance your life. We’ll suggest providers or groups that you may be interested in and health alliances for great local and organic food. To learn more about us and how our services can help your family discover exceptional health, contact us today!